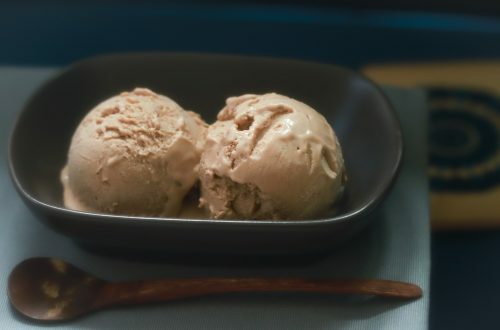 Dondurma ice cream, flavoured with mastiha, originates from Turkey and is also extremely popular in Greece, where it is known as Kaimaki ice cream. It is a thick, soft, creamy and stretchy ice cream, which refuses to melt, so is perfect to eat on a very hot day. But it is also the ice cream to enjoy on a cold winter day as it has a warm mouth-feel. The secret to this texture lies in salep (aka salab or sahleb), an ingredient sold in powder form. Salep is made from wild orchid tubers cultivated in certain areas of Turkey and makes a natural thickener for ice cream; it gives it chewiness, elasticity and warmth. 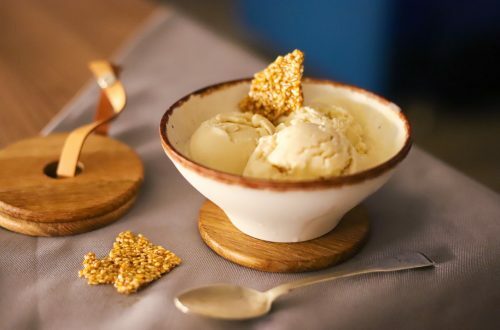 Dondurma ice cream is traditionally flavoured with mastiha, the resin of mastic trees grown only in Chios, a Greek island which lies close to the Turkish coast. The taste of mastiha is light, warm, sweet and refreshing. Both salep and mastiha may be unusual ingredients but are definitely worth searching for. Once you lay hands on them, you’re all set to make this ice cream which everyone is going to adore. You have to use 100% natural salep (aka salab or sahleb), with no added ingredients, or this recipe will not work. It is crucial for the outcome of this recipe as most salep sold in stores is a mix of salep with other ingredients. This salep mix serves to make an instant drink (you just warm some milk/water, add the recommended dose and your salep drink is ready). But this instant mix contains little salep, which will not be sufficient to thicken the Dondurma ice cream. So, make sure that you buy 100% salep, usually sold in specialist spice shops. 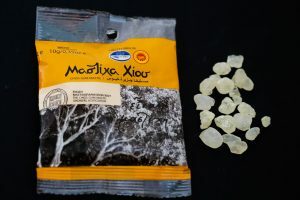 but you can trust any sources from The Chios Gum Mastic Growers . A little goes a long way when you use the real stuff, so resist the urge to add more; if you use too much, it starts to taste bitter. In a small saucepan lightly heat 1 tbsp. of sunflower oil with the mastiha crystals, stirring constantly until the mastiha melts (omit this step if using mastiha oil, in which case it will be added in Step 4). Once the mastiha has dissolved, add 1 cup of the milk. Warm it gently on medium heat and once it is tepid, add the salep and stir with a fork until fully dissolved and absolutely no lumps remain. Stir with a spatula until the mixture starts to thicken. Set aside. In a large saucepan, pour the remaining milk and the cream and add the sugar. Bring to a boil over medium to high heat, stirring constantly with a spatula. Remove from the heat and using a ladle start pouring the hot milk into the salep mixture, a ladle at a time. Whisk well before each addition, scraping the bottom and sides well as you go. You will not need to add all the milk, just enough to sufficiently homogenize and thin it to a fluid consistency. No lumps should remain, only speckles which are ok. Pour it back to the large saucepan and warm it while stirring constantly with a spatula. Bring back to a boil and lower the heat. Let it simmer for 20 minutes, without stirring, during which time a thick layer of foam is formed on top. Remove the saucepan from the heat and pour the mixture through a sieve into a metal bowl. Stir gently with a spatula for a few minutes, to help the steam evaporate and cool it down a bit. Place it over an ice bath to cool completely. Add the orange-flower water and stir well. (If using mastiha oil instead of crystals, add it now) Put it in a bowl with a lid and let stand in the fridge overnight, or up to 2 days. ice cream machines vary in sizes. 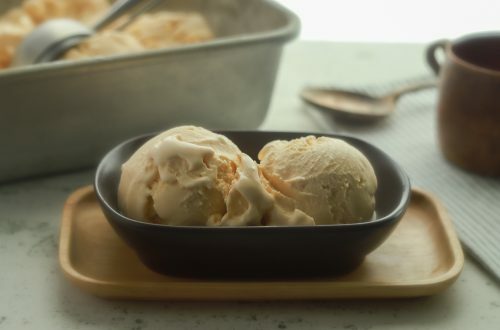 If the recipe for this ice cream base yields more than the 3/4 of your ice cream machine’s volume, don’t be tempted to overload it. Better keep the leftover for something else, like a base for smoothies. 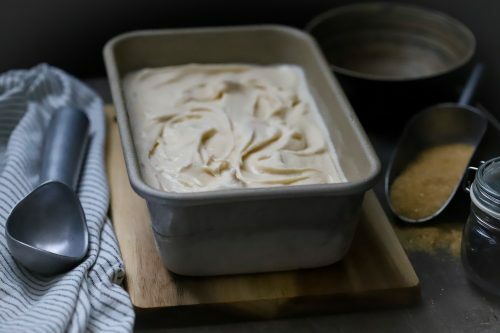 Once the Dondurma ice cream is thick and fluffy, move to a container with lid, seal well and place in the freezer. Leave for a few hours to set. Home made ice cream freezes hard, so it needs to be softened before serving. Transfer to the refrigerator and leave for about 30 minutes. Dondurma ice cream in Greece is served with sour cherry preserves on top or folded in. 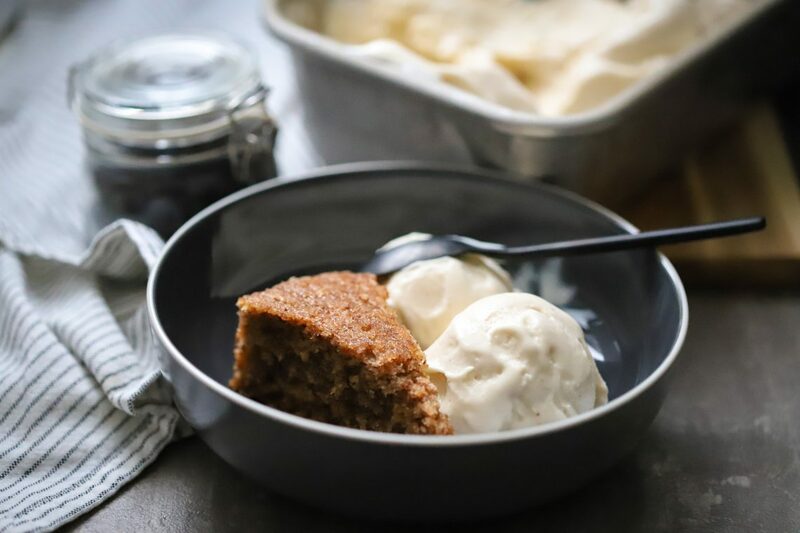 It is also perfect when paired with baklava or cake, any kind of nutty or fruity cake. In the picture I have paired it with a simple walnut cake.